Sycamore Church, Va., Aug. 9, 1864. 1st District of Columbia Cavalry. A little before 8 a. m. the quartermaster of the regiment with 2 teams and wagons was captured by a band of Confederate soldiers and citizens on the stage road near one of the outposts. 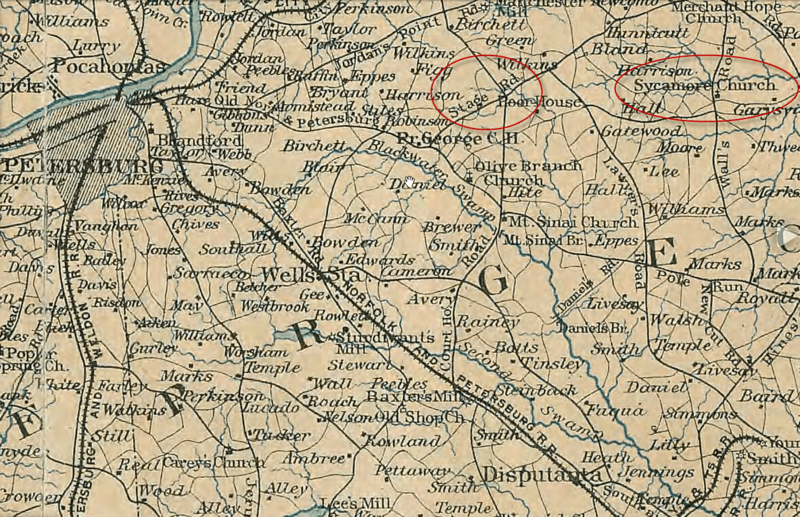 Maj. J. S. Baker ordered out the regiment and followed in the direction of Sycamore church, picketing the roads as he went to cut off the return of the captors. The pursuit was continued until 1o o’clock that night and 8 of the gang were captured. The rest, with their booty, made their escape. I was also able to locate the location of Sycamore Church in relation to some of the more recognizable points in the area. It’s slightly north of east from Petersburg, just north of east from Prince George Courthouse, just east of south from City Point, and northeast of Lee’s Mill. The 1st District of Columbia Cavalry was picketing this area in early August 1864 at the time of the capture of their quartermaster. I’ve circled the locations of Sycamore Church and the Stage Road on the map below. If you have any further details on this small affair from the Confederate side, please comment below.